Being aware of the subtle differences between running on a treadmill and jogging outside is essential for reducing your risk of injury. You’ve been cooped up watching reruns of “Friends” on the treadmill all winter. So when the temperature pushes 60, you grab your sneakers and jump at the opportunity to get some fresh air while you pound the pavement. Most of us don’t even think twice about changing up the location of our runs. After all, running is running right? Not quite, says Michael Conlon, physical therapist, running coach and owner of Finish Line Physical Therapy in New York City. While it’s great to get outdoors, being aware of the subtle differences between running on a treadmill and jogging outside is essential in easing your body through the transition and reducing your risk of injury. Here are the key things to be aware of before making the switch. On average, we should get new sneakers every 2-3 months or 200-300 miles. Don’t forget to warm up. It can be easier in a gym setting to remember to warm up, but “make sure you properly warm up the body; include some type of myofascial release/foam rolling, as well as global, three-dimensional functional stretches, not just a static stretch routine,” says Conlon. He also recommends implementing running drills unto the warm-up, which can help you work on your form and posture prior to your workout. Choose the right terrain. Should you head to the park? Run the track at the local high school? Or simply run around the neighborhood? “In general, most people say the softer surfaces like a dirt trail are easier on the body; they allow the soft tissue structure to absorb more, so there’s less impact on the joints and the bones,” says Conlon. “Concrete is the hardest, asphalt has a little more give and dirt trails are softest.” He also adds that as we age, we may prefer the trails to the concrete sidewalk. “An older person doesn’t have the same elasticity as when they’re younger in terms of the soft tissue structure, so they might like a softer surface,” says Conlon. Our bodies expend less energy running on a treadmill than running outdoors. 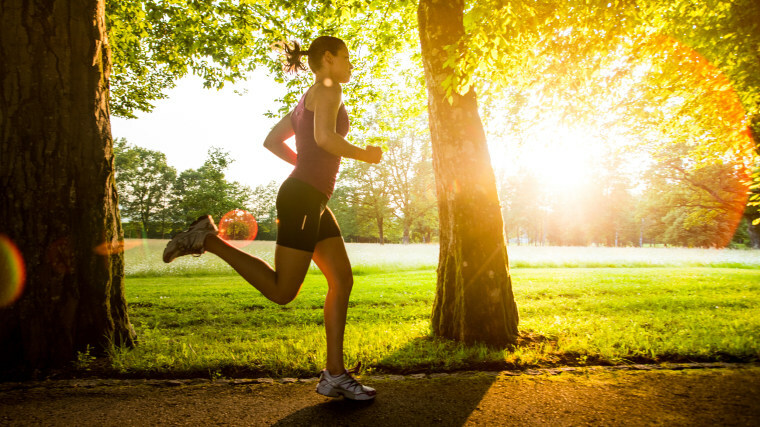 Know that you may be sore, even if you’ve been running all winter. Our bodies expend less energy running on a treadmill than running outdoors. Using the incline feature can help close that gap: Studies show that running on a 1% incline requires a similar amount of energy as running outdoors. But how many of us actually increase the incline every time we hit the treadmill for a jog? Because of that, running outdoors will likely feel harder. Your running terrain makes a difference too: “One thing about trails that people often don’t think about is it’s an unstable surface, if you’re going to be on rocks or having to move around a little bit, a lot of the stabilizers in our hips and ankles are going to work harder so you’ll hear a lot of people say the next day that they’re more sore than usual." Changing things from workout to workout elongates tissues and helps incorporates other muscle groups that can absorb some of the impact.